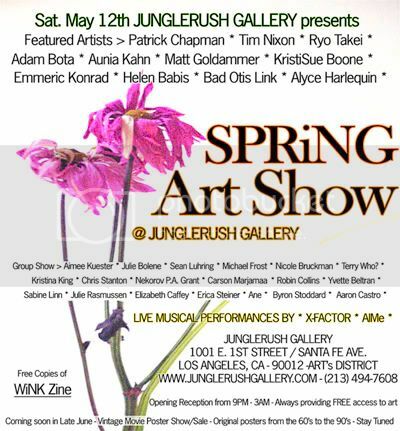 OPENING THIS SATURDAY AT JUNGLERUSH GALLERY IN LA -- Spring Mixed Media Art Show. May 12, 9pm-3am, 1001 East 1st Street, at Santa Fe Avenue, Los Angeles, CA. For more information, check out www.junglerushgallery.com. The show will be up through the end of May (specific dates TBA). Contact the gallery to inquire about private appointments.